is located on the south side of the old town. 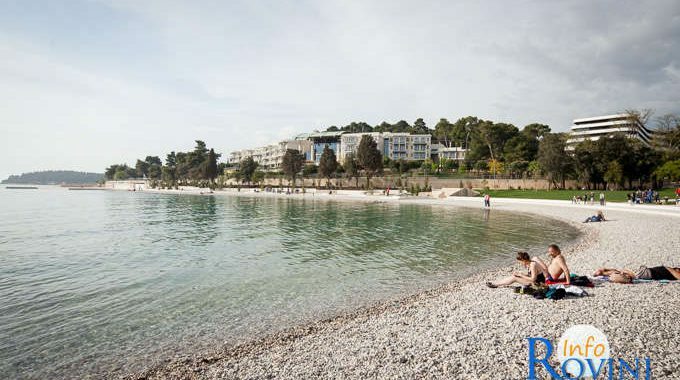 This beach reaches out until the end of the ACI marina until the forest of Zlatni rt which was declared as a preserved forest in 1961. Here you can walk on one of the most beautiful city footpaths. The footpath passes the three most luxurious hotels, the Monte Mulini, the hotel Lone, and the hotel Eden. Fir trees, a barbeque area, a watersports area, a bike rental outlet, shower spaces, deck chairs and similar facilities can be found on this beach. – beach form: pea gravel / rocks / concrete.